Maybe you planned your “cheat day”, maybe you didn’t… in terms of this article, it doesn’t matter. I’m going to give you a few techniques that I’ve tried, experimented with in the past, and found to be beneficial for kick-starting my metabolism back into fat-burning mode the next day and jump-starting my healthy lifestyle and habits onto the right track. There are two days where we can do absolutely nothing: tomorrow and YESTERDAY. Whatever happened the day before, why you ended up eating all of that food, how you feel about it today… all of that doesn’t matter anymore. Yesterday has come and gone. It’s now time to take advantage of TODAY and make sure you get the most out of these next 24 hours. What I’ve found in the past is that most people feel so guilty about the actions they went through engorging themselves in all of the food they ate (planned or unplanned). That guilt translates into the next day and they actually end up eating like sh*t again… simply because they feel like a failure and need to cope with it (this is an eating disorder – binge eating). My advice: forget about what happened yesterday and make sure today is much better! Get in a HEAVY, INTENSE workout! Lord knows how many calories you ate yesterday – 5,000? 10,000? 15,000? It really doesn’t matter… all that does matter is, YOU ATE EM’! Now, it’s time to put all of those calories and full glycogen stores to use. Train hard and heavy (6-10 reps on most sets of each exercise), keep rest periods short (to keep the regeneration of ATP short-lived and your heart rate elevated), stick to compound movements (like squats, dead lifts, and clean & presses, which demand the most amount of caloric use per set due to how many muscles are being used), and enjoy the pump! With all of those added carbs that you ate yesterday, you will surely have a fantastic workout, from strength, energy, and blood flow standpoints. My advice: perform 20-30 sets of a full body routine, sticking with the basics such as barbell dead lifts, standing shoulder presses, barbell squats, bench press, and clean and jerks. Keep the weight heavy to the point where the last 2 reps of your 6-10 rep set is difficult to complete. Keep the rest periods between 30-60 seconds after each set and work like hell! Perform some type of high intensity cardio! The reason we are going to stick to HIIT cardio today is because of how nice and full your glycogen stores are. We can store roughly 100 grams of carbohydrate in our liver and around 500 grams in our muscles. Believe me, after all the junk you ate yesterday, those storage compartments are bursting at the seams… so it’s time to use those carbs up! During high intensity training, the primary fuel source is glucose (the usable energy form of carbohydrates), opposite of low intensity training/cardio, where fatty acids are the primary fuel source. Since we have so many stored carbs ready to be used, we’re going to make sure we get the most out of them. Perform some type of sprint sequence, such as 20-30 second all-out sprints followed by 30-60 seconds of recovery, then repeat 10-15 times; put some weight on the prowler sled and do short, intense push bouts of 15-20 seconds followed by 30-60 seconds of recovery, then repeat 10-15 times; hop on a stationary bike and jack the resistance up all the way for a 15-30 second all-out pedal, then take the resistance back down to an easy pace for 30-60 seconds as an active recovery period, then repeat 10-15 times. I’m not saying do all of those things, but I just wanted to give you some ideas and some of the methods of HIIT that I like to utilize. Get back on track with your healthy eating regimen! The worst thing you can do after a “cheat day” is turn the following day into another “cheat day”! I’ll tell you from experience, the day after you engorge yourself with a ton of food, it’s going to be challenging (mentally) to get right back on track and start cooking your breakfast the next morning of eggs, egg whites, veggies, and oatmeal (I’m just assuming you eat the same things as I do, Lol). 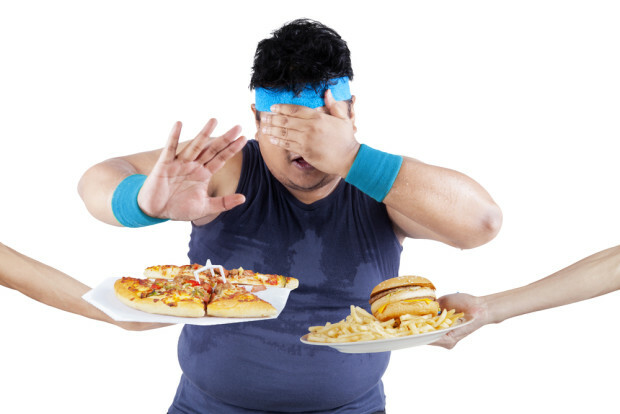 Due to the vigorous fluctuations in your blood sugar from the day before, you’ll wake up with a false sense of hunger, meaning your mind will be saying, “I need that fix of junk food again! I need that sugar!”… but in reality, you aren’t “hungry” for it and you certainly don’t feel like putting on a few more pounds by giving in. You will need the mental toughness and discipline to be in high gear on this day, to ensure that you stay on plan and go into the next day with momentum and a sense of accomplishment. As a coach, I don’t have my clients utilize “cheat days”. Number one is because “cheat days” are a negative thing. Anything with the word “cheat” in it implies that it’s bad, and you don’t want to participate in these kinds of practices that can surely lead to binge eating and eating disorders down the road (I’ve been through this). Number two is because you can do A LOT of damage in one day if you’re just trying to eat as much food as you can. You may wake up the next day and think, “Wow. I’m bloated and am holding a ton of water.” Well, you also could’ve gained anywhere from 2-5 pounds of PURE BODY FAT as well, depending on how much junk you actually ate. That’s one to two weeks of hard diet and training right down the trash. Number three is because it can turn your relationship with food into a terrible battle. I’ve known many people who have gone through this, and I’ve gone through it myself. It’s one of the worst feelings thinking that you don’t have control over your actions when you eat and binge and can’t stop eating. Cheat days encourage this type of behavior and I’m not a supporter of them. I like to utilize a couple free meals per week or incorporate calculated refeed days into my clients’ programs. The calculated refeed days are great because they are still following our flexible dieting strategy and tracking their macros, however, they’re able to eat some tasty carbs and junk that they haven’t had in a few days simply because their carb intake has been jacked up to a very high amount. This also gives them a little mental break from dieting and allows them to have some fun coming up with tasty new meals for the day. Flexible dieting is also a great strategy to use, which will help you with your relationship with food, your body, your health, and your state of mind. There’s no reason to think you “can’t” have a certain food because that food is “bad”. Such thoughts are ridiculous and not healthy for you or your physique long-term.